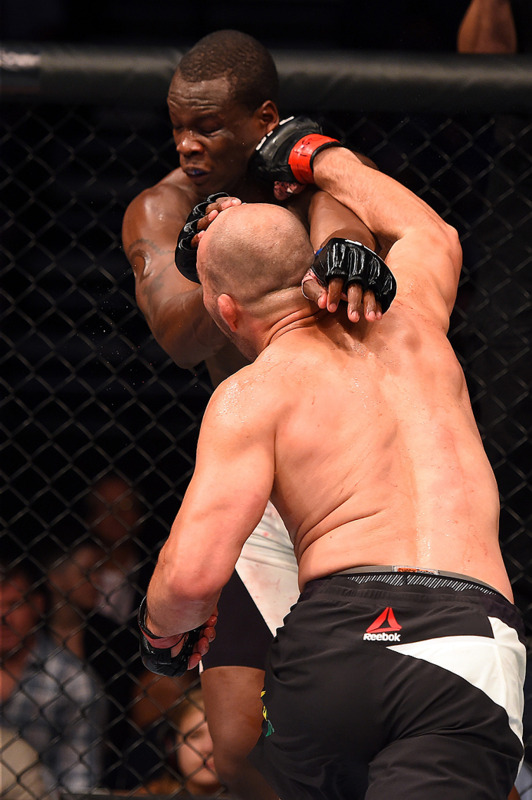 Former world light heavyweight title challenger Glover Teixeira turned wrestler in his UFC Fight Night main event against Ovince Saint Preux at the Bridgestone Arena in Nashville, Tennessee, and that strategy worked like a charm, as he spoiled the Knoxville resident’s homecoming bout with a third-round submission win. That he did, putting the number four-ranked contender from Danbury, Connecticut back in the title hunt at 205 pounds. Teixeira looked for a takedown early and got it, taking the crowd out of the fight immediately. They got back into it seconds later when the number six-ranked Saint Preux, a former University of Tennessee football player, got to his feet, but a low knee by the hometown hero brought a momentary halt to the action. When the bout resumed, Saint Preux dropped Teixeira to the mat with a kick to the body, and the Brazilian went on to take a barrage of hard shots on the mat and the feet until Teixeira was able to get a takedown. 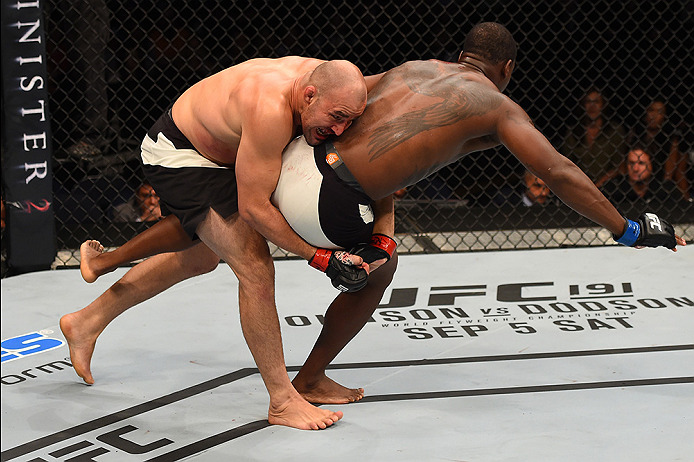 Once the two hit the ground, Teixeira wound up in the mount position, and he quickly took the back of his opponent. OSP turned back into the mount and Teixeira’s strikes, but a scramble allowed Saint Preux to escape and get to his feet. Teixeira went after a third takedown and got it, but Saint Preux reversed position and eventually rose, capping off a wild opening stanza. After some solid striking work to begin round two, Teixeira took the fight to the mat in the second minute, continuing to drain the gas tank of the hometown hero with his top game and ground strikes. With 40 seconds left, Saint Preux was finally able to make it back to his feet, but his late flurry wasn’t enough for him to steal the frame. Teixeira didn’t let up with his ground-and-pound attack in round three, and after the Brazilian got into the mount and began raining down blows, OSP gave up his back again and this time it cost him the fight, with a rear naked choke ending matters at the 3:10 mark. With the win, the 35-year-old Teixeira ups his record to 23-4; Saint Preux, 32, falls to 18-7.